Brent Betterly, Brian Church and Jared Chase, via The Huffington Post. Brandon and Connor had been part of the full-time occupation over the winter in Cleveland’s Public Square. After having grown frustrated with what they perceived as the Occupiers’ timidity — Schulte called it “passive gradualism” — the a group broke off from Occupy Cleveland and form their own, much smaller group, the “Revolutionary People’s Army.” At first it was mostly just a graffiti crew — tagging the phrase “rise up” around the city and putting up stickers, said Schulte. In a letter Stevens wrote from jail, Schulte told me, he described the feeling of helplessness he experienced right before the bust: “We saw this coming,” Stevens wrote. Andy Stepanian knows a thing or two about state repression of activists. As one of the animal-rights activists known as the SHAC 7, Stepanian has served three and a half years in federal prison after having been prosecuted under the Animal Enterprise Protection Act for costing animal testing laboratories more than $380 million in lost profits simply by operating a website. While the SHAC 7 case did not involve FBI entrapment or property destruction, the specific targeting of activists because of their anti-capitalist activism was reflective of a new era of post-9/11 state surveillance and repression. The FBI affidavit — analyzed here by RT — confirms, again, what many have warned about regarding the growing surveillance and security agencies in the United States: To keep themselves employed and justify their budgets, people in agencies like the FBI are orchestrating plots to catch “terrorists” who, otherwise, seem to be quite unable to do anything on their own. Last fall, Mother Jones reported on FBI efforts against Muslim extremists and concluded that many of those were instances of entrapment as well. In activist circles, there are a series of notorious cases of entrapment by federal authorities. In 2006, for instance, environmental activist Eric McDavid, encouraged by an informant known as “Anna,” was convicted on conspiracy charges. Another more notorious case is that of Brandon Darby — a well-known anarchist and activist-turned-informant — and his entrapment of David McKay and Bradley Cowder. The award winning film, Better This World, tells the story of how McKay and Cowder were convicted on charges of conspiracy to commit terrorism. Perhaps even more troubling than the manipulation of vulnerable individuals — whether they be political activists or members of mosques — is the way in which law enforcement meanwhile manipulates public discourse about terrorism, Islam or, in this case, a growing social movement. According to Schulte, the operation in Cleveland appears to have been part of a pre-planned narrative meant to paint Occupiers as a group with terrorist thugs in their midst, discouraging others from joining the movement. The FBI had a media statement prepared for immediate release on May Day after the arrests, and it hosted an unusually high-profile press conference the following day. There have been more than 300 pleas involving FBI informants in six years and such kind of overt media blitz from the feds is rare. Rolling Stone reporter Rick Perlstein observes, comparing two different anti-terrorism operations at the end of April, “that the State is singling out ideological enemies.” He reports that authorities are much less likely, for instance, to use tactics of entrapment against violent white supremacist groups. Investigative journalist Will Potter is an expert on state-sponsored targeting of radical activist groups who has testified before Congress on FBI entrapment and is the author of a book (and an accompanying blog) titled Green is the New Red. Potter calls the Cleveland Five conspiracy “part of the ongoing focus on demonizing anarchists.” Just a cursory look at the headlines in Chicago and Cleveland confirms a growing association of anarchism with violence and terrorism while alienating radical movements from potential supporters. Each of the Cleveland Five entered pleas of not guilty in federal court last week. As the trial of these young men plays out, their fates rest in which story is more compelling — their own victimhood, or the cunning of the federal agents. Although they were not taking action in the name of Occupy Cleveland, the future of Occupy and related movements in the United States is at stake in which story the public chooses to believe. Occupy Cleveland, one of the movement’s longest-lasting encampments, had the remnants of its occupation removed by police in the middle of the night on May 3. There was little public outcry, when the city revoked its permit after the May 1 arrests. In a media statement following the arrests of the Cleveland Five, Occupy Cleveland affirmed its commitment to “active non-violence.” Individual occupiers have chosen to join the support team for the Five, but Occupy Cleveland as a whole is steering clear of commenting on it further. “When you take away a space of legitimate protest,” adds Stepanian, “less legitimate forms of protest become more prevalent.” Events like the arrests of the Cleveland Five can create schisms within movements, which the state exploits to create a climate of fear within and about activist groups. The NATO 3 arrests and bond hearing, for instance, just before this weekend’s mass No NATO demonstration, will serve to deter people from participating and obscure the reality of the protest’s message. 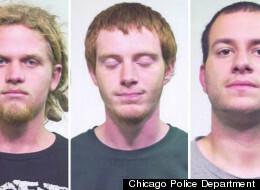 In Chicago, the NATO 3 are each being held on $1.5 million bail. More details will emerge in the coming weeks, but Michael E. Deutsch, legal counsel for the NATO 3, has said that two of the 11 arrested during a house raid in Bridgeport were Chicago Police Department informants and have since disappeared. The truth of what really happened in Cleveland and Chicago may or may not emerge in the courtroom. But it is clear regardless that Occupy is now being exposed to a new level of state repression, and that it is taking a toll on what has still remained a nonviolent protest movement. Techniques of surveillance and infiltration targeting persons or groups believed capable of crimes have been used for decades at lower levels of law enforcement as well as the federal level and long been accepted by U.S. courts. When they were used to catch a U.S. Senator in a classic case of corruption in the 1980s, the whole nation applauded — and legal challenges to the FBI’s methods failed. When FBI surveillance and “entrapment” in 2001 led to the arrest of a U.S. citizen who turned out to be a Russian spy, no objections were raised. The justification has usually been that if there is evidence of intention to engage in unlawful conduct, and the suspects activate that intention in a context controlled by law enforcement, the result is prevention of that conduct and verification of the intent. The reality is that the use of “sting operations”, as they were most often called in the past, has been endlessly discussed, and there is little evidence that they’re distrusted by the public, given countless movies and TV shows extolling their drama and effectiveness. To claim that this strategy of law enforcement is something politically motivated and intrinsically nefarious, because it involves surveillance and infiltration, much less that it is evidence of “repression”, may agitate those who are sympathetic to groups that believe they’re targeted by law enforcement, but it’s very unlikely to impress the courts. That doesn’t mean that these techniques are justifiable in this kind of case, and their use should certainly be challenged anew, since they have obviously become more sophisticated and intrusive — extending to the point of being the catalyst for criminal intent. But what is needed is a fresh legal and constitutional argument about why its use in this context actually endangers an important exercise of civil liberties. It’s very doubtful that these cases will be decided, as the article above suggests, on the basis of “which story is more compelling — their own victimhood, or the cunning of the federal agents.” The courts should be asked to decide them on the basis of whether the use of these techniques to stop these particular offenses has crossed a line of jeopardizing the exercise of constitutionally protected rights that were integral to the previous, established activities of those who were encouraged in these acts by infiltrators. The record of original nonviolent intentions and rights-exercising methods of individuals or groups who are targeted in these operations must be the cornerstone of their public and legal defense wherever that’s possible, not the claim that the government is engaged in some sort of political vendetta. The latter won’t be seriously considered. Nevertheless, I suspect that you have a point that, in the court of public opinion as well, people are unlikely to blame their own government or law enforcement unless the movement maintains a culture of serious nonviolence to heighten the contrast between itself and the state. Thank you for the thoughtful and articulate comment! Non-rhetorically, to what extent does the fault lie with Betterly, Church, and Chase? It’s a good question, Tom, and I think they do bear some responsibility. But, again, it’s a matter of degree. The state and its agents regularly commits acts of terrorism and violence–at home and abroad–with impunity. These young men may have contemplated street battles with cops or other things–I don’t know–but they were goaded into it under well-trained, experienced informants who knew where they wanted these folks to end up (in jail under terrorism charges). Again, it’s a good question, to what degree or responsibility does one have for how one is influenced? It’s a question that weighs heavy on me and other activists with a variety of different perspectives. To be clear, I do not condone what these cases allege that the five and three were conspiring to do. I don’t know the truth but am doubtful that a court of law whose interest generally lies in protecting the institutions of the state and society will give these kids a fair shake. To me, this is a case of fringe, marginalized kids against the power of the national security state. It’s a rigged game. Protest movements–of all types–need to understand that and learn ways to engage a system that uses such depravity to undermine them. So you approve of what these guys were going to do? I do not believe that violence against persons or the kind of property destruction such as blowing up a bridge to be either legitimate forms of protest or morally or legally justified. I want to be careful in thinking and talking this through to separate the ethics of action when there are a number of different characters in the plots I described above. It seems to me to be a bit of a stretch to say that the FBI or police stopped an attack from happening when the complaints against them allege that the police provided the material support and intellectual encouragement. In the case of the Cleveland Five, they were brought to the edge of the swimming pool and, as some have pointed out, made the choice to jump in. But what they jumped into was a pool covered with glass. This case is not police work that uncovered a plot that was devised on its own, set in motion, and then interrupted and prevented from happening–even if the five thought that wass the case. To me, there is a difference and the questions that must be asked are 1) what is in the state’s interest in targeting anarchists and 2) why these guys? The choices and circumstance these individuals–and others–have before them contribute to the plot. The state is engaged in unethical behaviour that is, quiet likely, creating more terrorists, or at least the impression of it. That has the social consequences of negatively impacting movements that threaten the interests of the state. The ethics of protest that embrace this kind of property destruction or attacks on people are equally unjustified and, I believe, counter-productive for a movement both in terms of inviting more repression and losing public support. Once again Obama’s Homeland Security apparatchik are forging new legal ground with their case against the Cleveland 5: “Conspiracy with the U.S. government to commit criminal stupidity.” While war crimes, institutionalized violence on a massive scale, state terrorism by the U.S., Israel and NATO, global economy collapsing financial fraud and rampant violations of civil and human are ignored phony “crimes” like this are manufactured for the sole purpose of discrediting Occupy and revolutionary anarchism. Which raises the fundamental legal issue underlying the U.S. shamocracy, “what are the crimes and who are the criminals?” To further illustrate this latter point, lets look at the FBI’s key operative in the Cleveland 5 case, Shaquille Azir. A convicted felon, with a long “rap sheet,” in November 2011, Azir walked away from a new conviction for grand theft and passing bad checks with “probation.” This was just after Azir agreed to attend an October 21, Occupy Wall Street rally in Cleveland to facilitate the FBI’s “probe” of the young anarchists. Later it was Azir who arranged the meeting with an undercover FBI agent and fronted the money to buy the fake explosives.